Malted milk powder and vanilla flavor this wonderful creamy frosting. 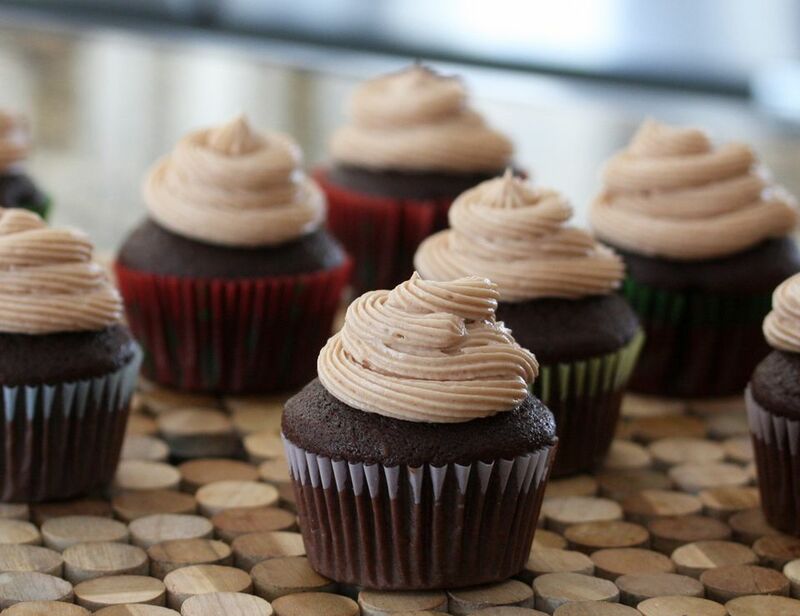 The moist chocolate cupcakes are easy to make and delicious, and the malted milk frosting is such a nice complementary flavor. Make these cupcakes for a potluck, a party, or any occasion. They make a great weekend treat! Pipe the frosting onto the cupcakes for an extra special look. Line 18 muffin cups with cupcake papers. In a saucepan over medium heat, combine the water, 1/2 cup of butter, and the granulated and brown sugars. Heat, stirring, until butter has melted. Whisk in the cocoa powder until the mixture is smooth. Set aside to cool completely. Combine the flour, baking powder, baking soda, and 1/4 teaspoon of salt; set aside. In a mixing bowl, beat the eggs and 2 teaspoons of vanilla until blended. Slowly beat in the cooled cocoa, butter, and sugar mixture until well blended. Stir in the flour mixture until blended. Increase mixer speed to medium and beat for about 2 minutes, until batter is smooth. Fill cupcake papers about 1/2 to 2/3 full. Bake for about 18 minutes, until firm and cake springs back when lightly touched with a finger. Cool in the pan for 10 minutes. Remove the cupcakes to a rack to cool completely before frosting. In a large mixing bowl, combine the 1/2 cup of butter, 3 cups of confectioners' sugar, malted milk powder, a pinch of salt, and 2 teaspoons of vanilla. Beat on low speed of electric mixer to combine, adding 4 tablespoons of milk, a tablespoon at a time. Add more milk or confectioners' sugar as needed for piping or spreading consistency. Beat for 2 minutes, or until smooth.